Date and time: June 20-21, 11:00 pm -05:00 am, The Palace Square and Embankment. 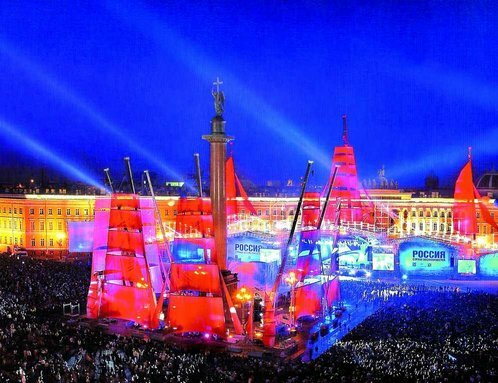 The Scarlet Sails (Russian: Алые паруса) is a celebration in St. Petersburg, Russia, the most massive and famous public event during the White Nights Festival. The tradition is highly popular for its spectacular fireworks, numerous music concerts, and a massive water show including battles between dozens of boats full of pirates on the waters of the Neva river. This tradition began after the end of World War II, when several Leningrad schools united to celebrate the end of the school year in connection with the symbolism of the popular 1922 children’s book Scarlet Sails by Alexander Grin. During the first celebration, a boat with scarlet sails sailed along the English Embankment and the Admiralty Embankment towards the Winter Palace. Although it was designed to update the rusty revolutionary propaganda, the “Scarlet Sails” tradition eventually evolved into a massive demonstration of freedom from “schools and rules” and has become the most popular public event annually celebrating the end of school year. This beautiful fairy tale, published in 1923, took place in a fictional land where a sailor named Longren, after the premature death of his wife, was forced to retire and make toys while he cared for their young daughter, Assol, in a quiet port city. One day, the young woman chased a toy boat, one she was supposed to sell, down a stream deep into a forest, where she ran into an old man named Aigle, who claimed to be a great wizard. He predicted that a prince would someday come for her and take her away to live with him in a faraway land on a ship with scarlet sails. This event shows the future advantages for young people. The Herzen House Hotel is located in 10 min.by walking distance from the Palace Square. Please pay attention that the city centre traffic restrictions will be introduced.